We’re starting 2016 off right, with brokerage integration! This blog post will review this exciting new capability plus the other good stuff in our latest release, Stock Rover 6.3, which went live this morning. Because Stock Rover is a web-based app, no installation or effort on your part is required. Whenever you login to Stock Rover, you’re always using the most up-to-date version. We know that many of our users have been eagerly awaiting this day. Behind the scenes, we have been working to make it possible for Stock Rover accounts to connect to brokerage houses for a long time, running into several complications during development that extended the process. So we are extremely pleased to now be able to bring you brokerage integration, a capability that will allow you to directly connect your Stock Rover portfolios to your brokerage portfolios, meaning they will stay up to date automatically, without any imports or manual updates needed. Brokerage integration is currently in beta. During this period, it is free for all users to connect to their brokerage houses and “link” Stock Rover portfolios to brokerage portfolios, up to the maximum number of portfolios allowed (10 for Basic users; 30 for Premium users). After the beta period, we will determine the policy on brokerage integration for Basic users. Premium users will have the ability to connect to multiple brokerage houses with multiple linked portfolios as part of their paid plan. In the meantime, we hope that all users take advantage of this brand new capability. 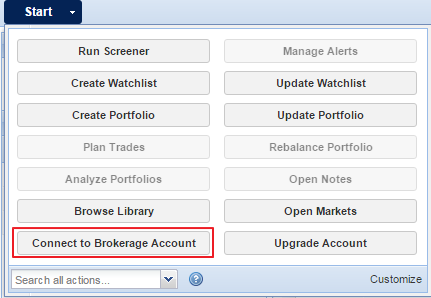 To get started, go to ‘Connect to Brokerage Account’ in the Start menu, as shown below. Then follow the prompts to find and connect to your brokerage house. You will be briefly redirected through a Yodlee interface during this process. Yodlee is the leading industry provider for financial account aggregation and it is our trusted third party that makes brokerage integration possible. Once connected, you’ll be able to manage your brokerage connections through the Brokerage Connections panel in Stock Rover, shown below. 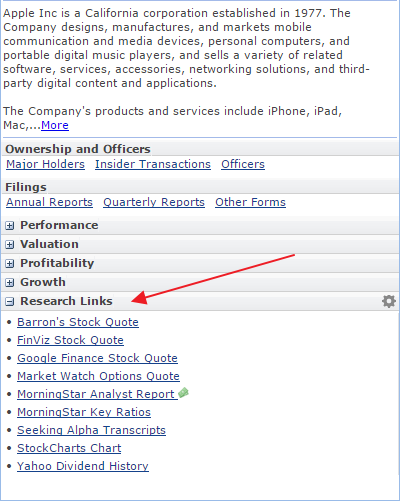 Stock Rover will create new “linked” portfolios for each of the portfolios in your brokerage account, and you can easily redirect these links to existing portfolios in your Stock Rover account (using the grey dropdown arrow as pointed out below). 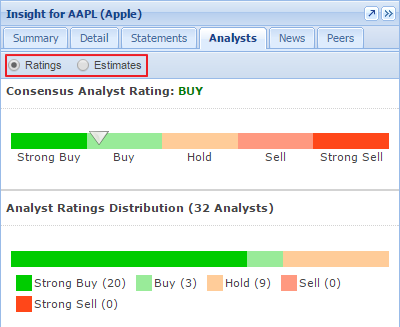 Linked portfolio updates occur nightly as well as whenever you log into Stock Rover. You can also manually refresh the connection (find this option in the gear menu of the Brokerage Connections panel). Once a portfolio is linked, it cannot be modified. 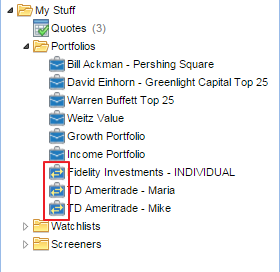 However, you can always unlink a portfolio to modify its history, and then re-link it. Note: During the beta period, bonds, options, and other positions not supported in Stock Rover will not carry over from your brokerage account to your Stock Rover portfolios. In the next release, we will be able to support all positions. Take a few minutes this week to connect to your brokerages for seamless, up-to-date portfolio tracking from here on out. For additional instructions, please see our Brokerage How-To. The beta period allows time for us to flush out and solve any issues that were not identified during the internal testing phase. If you encounter any issues with your brokerage connections, we want to know about them—email us atsupport@stockrover.com. And if everything works swimmingly and you are as happy as a clam? That helps us too, so feel free to give a thumbs up. On a first glance, the Insight panel might look the same as ever, but in fact a few things have been shuffled around to make the panel a little roomier and more comfortable to navigate even as we have added data. Can you spot the differences? Let’s explore. First notice two new tabs, Statements and Analysts. 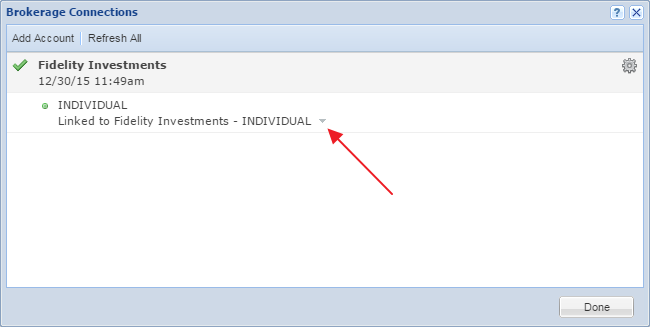 Statements contains the full Income, Balance Sheet, and Cash Flow statements for the selected company, formatted in a hierarchical tree with sections that can be expanded or collapsed. Previously we offered most of this data in the Detail tab, but now we have all of it (therefore the ‘Full Statement’ links to Morningstar that we used to have are no longer needed). 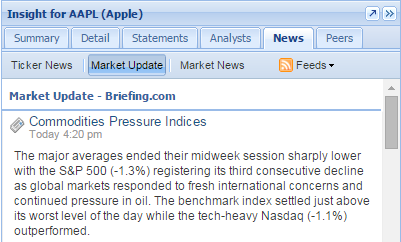 In the News tab, we’ve added the Market Summary from Briefing.com (a snippet is shown below). Just use the buttons at the top to switch between Ticker News, Market News, or a Market Update. Select the news feeds you want to see using the ‘Feeds’ dropdown menu. It’s very easy to customize this list. Just click the gear icon to select from a list of common financial sites or to set up your own custom links. So that covers the major changes in the Insight panel. We hope you like this reorganization and find it even easier to find deep fundamental data and relevant links about a stock you are researching. All of the same options for searching notes are still available. Click the pop-out button to detach this window from the Stock Rover UI and keep it open while you work. While not new with this release, Premium users might also be interested in our Comments feature, which lets you take brief notes directly in the Table. 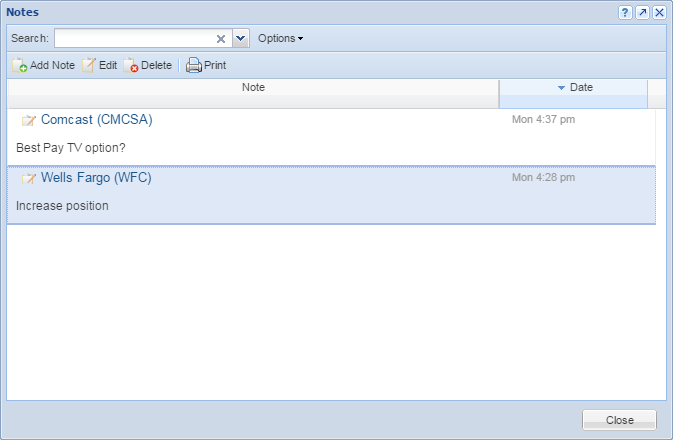 You can access this feature by adding the Comments column to a specific view just as you would add any other column. You can also automatically add this column to all views by freezing it, an option which is accessible from the comments column menu (dropdown or right click). Unlike our Stock Rover phone app, no login is required. However, if you are logged in, you’ll have the ability to load a ticker list from your portfolios and watchlists if you search for them by name. Try Stock Rover Markets when you’re on the go. 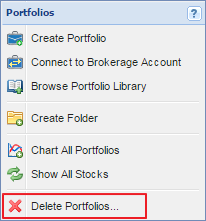 First, you can now delete multiple portfolios, watchlists, or screeners. This is great news if you like to create screeners, watchlists, and sample portfolios for short-term use. Or if you occasionally want to clear out some older items that have been building up in your account to make room for new ideas. Deleting multiple items is simple. Right click a folder in the Navigation panel and select ‘Delete…’ (shown below). 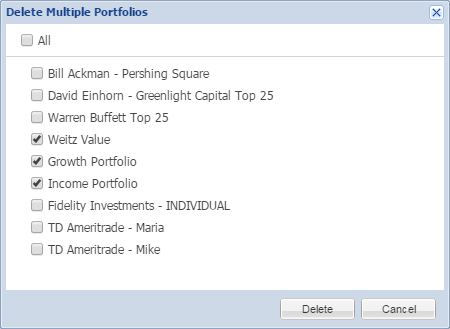 Now with brokerage integration, the multi-delete feature can help you get rid of old portfolios to make room for new linked portfolios, or to quickly get rid of duplicates. 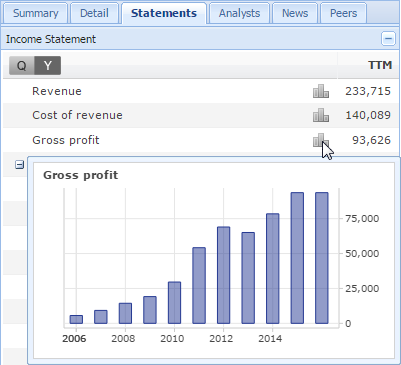 Premium users can now see up to 505 rows on a single page in the Table. Previously, only 110 tickers were shown on a single page. This allows you to load, for example, the entire S&P 500 on one sheet of the Table. To see all these metrics in one place, import the New 6.3 Metrics view from the Library. You can use the Explain feature for a definition of any that you aren’t familiar with. Those are all the significant updates with our newest release. We hope you’ll enjoy taking Stock Rover 6.3 for a spin!